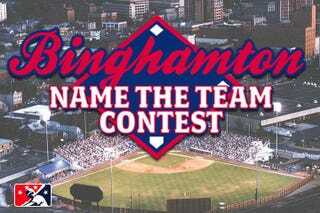 The Double-A Binghamton Mets are holding a poll to pick their new team name. The Double-A Binghamton Mets are holding a poll to pick their new team name. Will it be: Bullheads, Gobblers, Rocking Horses, Rumble Ponies, Stud Muffins, or Timber Jockeys? Wield your voting power responsibly.